PHOENIX—Community leaders came together today to launch a campaign to show the generous people of Maricopa County how they can be part of long-term solutions for those experiencing homelessness. The campaign builds on the vast network of goodwill and giving that exists in Maricopa County and adds practical, sustainable ways to make a difference in the lives of those experiencing homelessness. Through this effort, community partners hope to connect more homeless individuals with services that can help end their homelessness; improve public health and safety; and, encourage healthy giving Valley-wide beyond the holiday season. Partners believe healthy giving can change a life! Each holiday season, cities across Maricopa County experience a rush of faith-based groups, non-profits, and individuals who want to help those who are experiencing homelessness. Food, clothing, and other supplies are often handed out on the streets. This generosity is incredible and is so appreciated. Unfortunately, there are unintended consequences including wasted food, unsafe and unsanitary conditions in neighborhoods, and fewer individuals turning to established non-profits for services that could help them end their homelessness. Handing someone food on the street, while well-intended, can prolong their homelessness. Healthy giving, all year long. This is giving that takes the long-term needs of the individual and the community into consideration. The Healthy Giving campaign encourages you to direct your time and resources to community service organizations that prioritize building personal relationships with those they serve, relationships that can improve quality of life and can lead to housing, employment, and greater independence. This can mean volunteering in a place where you can make those face-to-face connections, or donating to groups that ensure your gifts are received by those in need and will have a lasting impact. You can learn more about healthy giving at GiveSmartAZ.org. Who is leading the effort? The Healthy Giving Council. The Council is a coalition of concerned citizens, faith leaders, social service providers, neighborhood stakeholders, businesses, government partners, and others united in their desire to provide lasting, long-term help to those experiencing homelessness year-round. How is Maricopa County involved? Maricopa County believes homelessness is a regional issue. The county works with dedicated and experienced partners across the Valley to provide critical services to those experiencing homelessness. Services include access to affordable housing, sheltering services, mental health and justice support, employment opportunities, and more. Maricopa County supports the goals of the Healthy Giving Council. 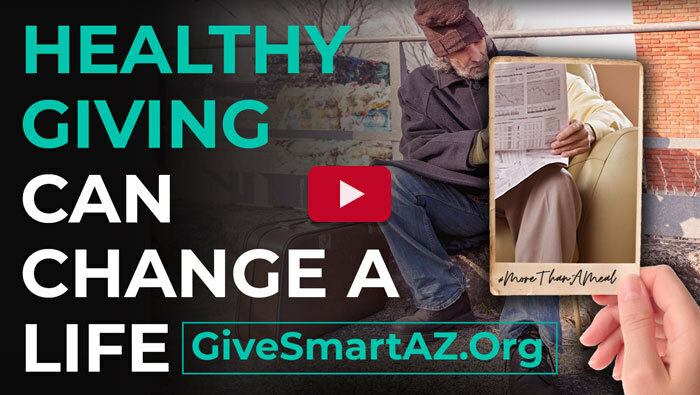 You can learn about giving opportunities in your community and educate yourself on the issues surrounding homelessness in Maricopa County by visiting the Healthy Giving Council’s website at GiveSmartAZ.org.